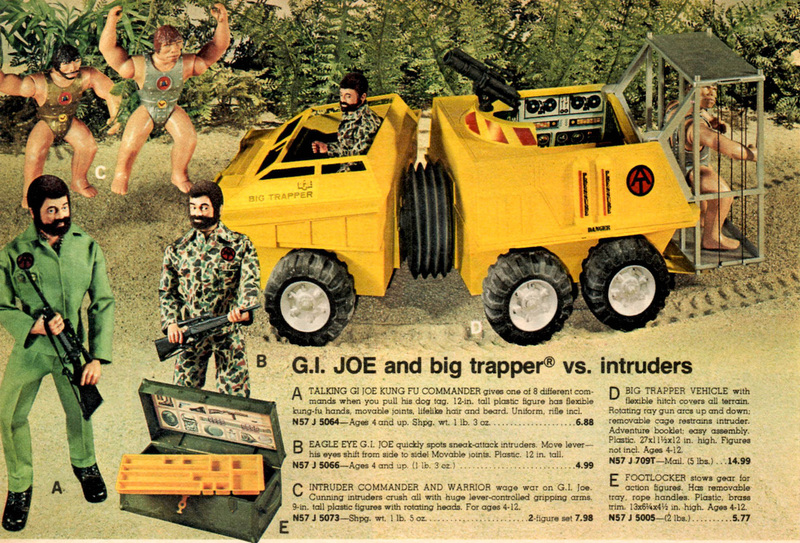 GI Joe takes the battle to the Intruders with the Big Trapper (7498), a sturdy armored vehicle built for tough terrain. the chassis is based on the earlier Mobile Support Vehicle with a revised superstructure. The two parts of the unit are joined by a piece of flexible black plastic that can tend to crack. Seats 1n the front end are done on the cheap with just a cardboard insert. The 'bars' of the capture cage on the back are elastic so captured Intruders can show their strength by breaking out. The 1976 Wards catalog ad for the Big Trapper.